Dominik Paris won the penultimate race Saturday, preventing Swiss rival Beat Feuz from locking up the title with a race to spare. The Italian trailed then leader Feuz by 0.30 seconds at his last intermediate time but made up more than a half-second in a blistering finish section to win by 0.25. "I took all the risks, I tried everything. Luckily it worked out," said Paris, who needed to finish ahead of Feuz to stay in contention. The last downhill of the season is scheduled at the World Cup Finals in Soldeu, Andorra, on March 13. Feuz won his first downhill title last year, also in the season-ending race, when he beat his challenger Aksel Lund Svindal of Norway. 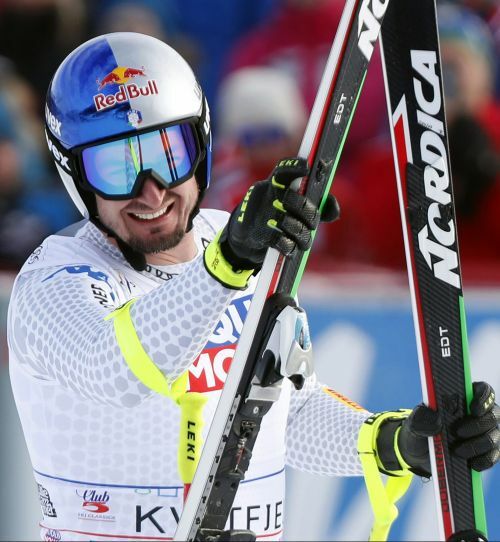 This time, Feuz is 80 points clear of Paris in the standings, with a win worth 100 points. "The tension remains. I hoped it would be decided today," Feuz said. "But I am happy to be 80 points ahead. Against Dominik you need every point you can get." The speed events of downhill and super-G, where the top four are separated by just nine points, are enjoying a close fight for the No. 1 spot in the final week of the season. In sharp contrast, the slalom and GS competitions were decided last month, with seven-time overall champion Marcel Hirscher of Austria claiming both titles. After winning the classic events in Bormio and Kitzbuehel, this was Paris' third downhill victory of the season, and 11th in total. Christof Innerhofer (2012-13) and Kristian Ghedina (1996-97) were the only other Italians to win three downhills in one campaign. Feuz has won just one race this season, in Beaver Creek in November, but became the first skier since Austria's Stephan Eberharter in 2004 to finish on the podium in six straight downhills. He had top-three results in 11 of the last 12 races. Paris' victory was threatened by Matthias Mayer, who led the Italian by 0.42 halfway through his run. But the Olympic super-G champion from Austria came off the race line in the final part of his run and finished 0.37 behind in third. Downhill world champion Kjetil Jansrud of Norway finished more than a second off the lead.